The Tommee Tippee Perfect Prep is a bottle making machine designed to prepare formula feeds quickly and easily. I know that World Health Organisation and NHS Guidelines state that Breastfeeding is the best way to feed a baby, but for some people, myself included breastfeeding is not an option. I Breastfed George in recovery after my c section and he then needed a heel prick blood sugar test as I had gestational diabetes. The test came back showing that George had low blood sugar and I was advised by the midwife to formula feed George as she said that formula feed would regulate his sugar better than breastfeeding. That was unfortunately the end of our breastfeeding journey. Having not been able to breastfeed Lily previously (due to an insufficient supply) I knew that having a hungry screaming baby while waiting for a feed to be prepared with a kettle was far from an ideal situation. Fortunately, Lily was only a few weeks old when we were recommended the Tommee Tippee Perfect Prep machine by a friend. We bought one and loved it. It was so quick & easy to prepare a feed. When I got pregnant with George I read that the machine had a new upgraded model called the Tommee Tippee Perfect Prep Day & Night and that now the lcd screen lit up to be easily seen at night. 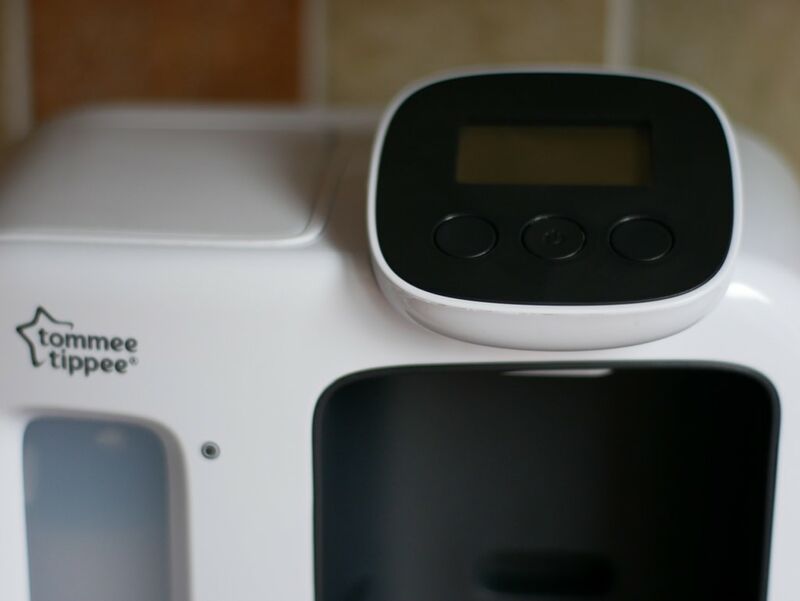 I got in touch with Tommee Tippee, explained that I had used the machine with Lily and would love to road test the new one and they kindly sent me one for this review. The bottle making machine was really easy to set up following the instruction booklet – it took about 10 minutes in total. I set the machine up a couple of weeks before George was born and made up a dummy feed to so that once George was here I knew I was confident using the machine and he wouldn’t have to wait for food if I needed to formula feed. I love the new LCD display screen as it is really easy to see; especially when bottle feeding at night. The LCD display give step by step instructions on how to prepare the feed so you literally cannot forget a step. 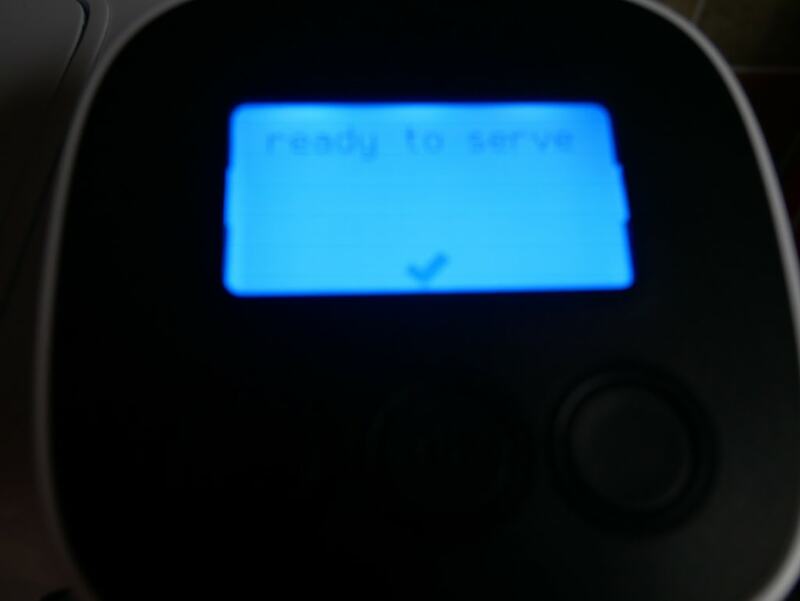 Feeds take just under 2 minutes to prepare & in my opinion that makes the Tommee Tippee Perfect Prep Day & Night machine well worth the money as having to wait 30 minutes in the day or worse still the middle of the night for a kettle to boil and cool while a baby cries is far from ideal & easily avoided with this gadget. To use the machine, you put the required number of level scoops into the bottle, pop the bottle under the water dispenser and press the start button – selecting the number of ounces you would like to prepare. The machine first dispenses a hot shot of water to kill off any bacteria in the formula (formula milk is not sterile so this is an essential). The machine then prompts you to remove the bottle and give it a shake to ensure the formula is well mixed. It then dispenses a cool shot of water. Then the feed is ready to go! The Machine is very convenient for bottle feeding and I would definitely recommend it! See my FAQ’s below for any specific questions you may have relating to the machine. You should always contact your midwife or health visitor for the most up to date advice before using any baby feeding equipment including the Tommee Tippee Perfect Prep machine. 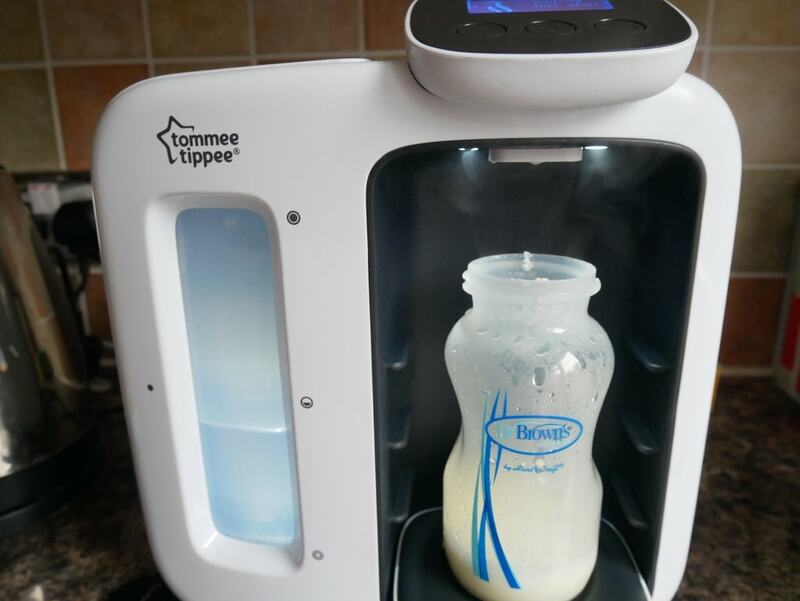 Can the Tommee Tippee Perfect Prep Machine be used with any make of bottle? Yes it can. We use Dr Brown’s Bottles as George has reflux. The bottle stand on the machine has an adjustable height so you are easily able to move it to accommodate the height of any bottle brand. Can you prepare Neocate with the Tommee Tippee Perfect Prep machine? George is on Neocate prescription formula as he suffers from reflux and cows milk protein allergy (CMPA). I called Nutricia the manufacturer of Neocate to advise if it could be used with the Tommee Tippee machine and they said they tested it as they had a lot of queries on the subject. They assured me that I was able to prepare Neocate with the bottle making machine. If you are on a formula of any kind (including Neocate) do give the manufacturer a call before using the machine to check that it has been tested with their milk and can prepare it safely. Does the Tommee Tippee Perfect Prep machine remove bacteria from formula? Can I just buy a normal water filter to use in Tommee Tippee Perfect Prep machine when the water filter needs changing? No. It is extremely important to use the Tommee Tippee Perfect Prep filter as it had been specifically designed to remove bacteria from formula powder. How do I clean the Tommee Tippee Perfect Prep machine? Tommee Tippee have produced this great guide on how to clean the machine. I have found black mould in the Tommee Tippee Perfect Prep Machine, what should I do / is it still safe to use? Tommee Tippee have been advised that some parents have found black mould in the Tommee Tippee Perfect Prep machine. Tommee Tippee has obviously taken the findings very seriously – asking parents who have discovered anything in the tubes to get in touch when Julie first made her complaint. “We’d like to thank all parents for their patience, whilst we carried out our investigations into concerns about some Perfect Prep machines. We’re pleased to advise that we now have an update for you, which includes some additional ways to clean your machine. “After extensive discussions with the filter manufacturer, we remain 100% confident that it is impossible for bacteria to enter the pipework through the Tommee Tippee Perfect Prep filter. “We are aware – because you’ve told us – that some affected machines have at some point been used with a non-Tommee Tippee filter. “Other brands do not contain the ultra-filtration antibacterial filter needed to remove bacteria, which could lead to bacteria and visible (but harmless) carbon deposits forming in the pipes. Even if a non Perfect Prep filter is used only once, it can allow bacteria into the system. “However, we do know that some mums who say that they have only ever used the Tommee Tippee filter, are still seeing build-up. “If this is the case, it is possible that bacteria has entered the pipes through accidental cross-contamination. It’s easy for this to happen, but, don’t worry, this can be remedied with the cleaning cycle described below, and by taking some simple additional preventative every-day steps when changing the filter and cleaning your machine. “Either way, if you are concerned about build up in your machine for any reason, you can clean the machine and remove the build-up by running the following cleaning instructions. “Run a first cleaning cycle with a sterilising solution such as Milton or food grade white vinegar. Then run a second cleaning cycle with water as per the normal recommended cleaning cycle instructions. “Our tests have shown that doing this will remove any build-up or carbon deposits. You can then continue to use your machine as normal with confidence. “However, it is very important that your everyday routine includes simple hygiene steps such as keeping formula away from the hopper and only ever holding the top of the filter. A full update of instructions and support on cleaning the machine and handling the filter will be available at www.tommeetippee.co.uk/perfectprepcleaning. Disclosure: We were sent the Tommee Tippee Perfect Prep Machine FREE in exchange for an honest review.